The Niger State Police Command said on Thursday it had intercepted a four-man gang for attempting to kidnap one Abdullahi Aliyu of the Chanchaga Local Government Area of the state. The gang was led by a man helped by his boss. The suspects, Safiyanu Hamza, 2; Mohammed Umar, 30; lbrahim Adamu, 20; and Isah Usman, 25, all from Chanchaga, were said to have confessed to the crime during investigation. Northern City News gathered that the suspects who were farmers took to crime to make quick money. Hamza told the correspondent that their intended victim, Aliyu, was his master who gave him six cows to rear. “I have disappointed my master (Aliyu) and I wouldn’t like to give reasons for none will suffice. How can I face him after doing evil to him, l am finished,” he lamented. 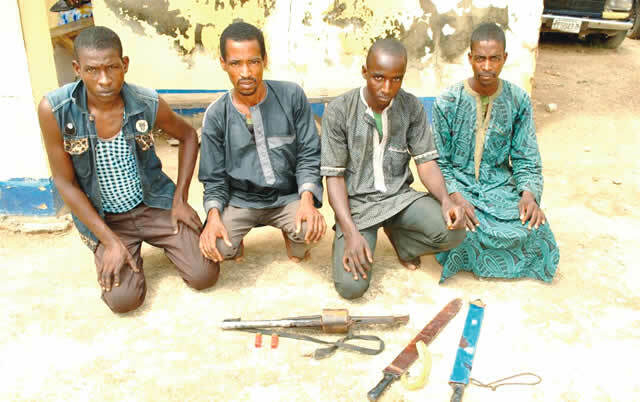 The command’s Public Relations Officer, Muhammad Abubakar, said the operatives recovered one locally-made revolver gun with two live cartridges and two cutlasses from the suspects.